The perfect tool to catch criminals at 200 mph. There are some countries where police supercars don’t look conspicuous. One of those countries happens to be Italy. Take its latest addition to the Italian Highway Patrol, for example: these guys don’t chase down criminals in a Ford Crown Victoria, but a Lamborghini Huracan. The automaker recently delivered its second Huracan exotic to the police force in Rome, where it will be used for highway patrol service and medical transport. All the equipment you would expect to find in a standard police car is present. Lamborghini added a computer with a tablet for the passenger, a gun holster, video recording equipment, a police radio and a siren, obviously. It will also be used for medical transport, which is why it’s been fitted with a luggage compartment equipped with a refrigeration system to transport organs as well as a defibrillator. "The Highway Patrol is constantly engaged in meeting the need for medical assistance. In 2016, there were 176 requests for assistance from all over Italy, requiring involvement from 462 police patrols," Lamborghini says. "120 patrols provided assistance to persons afflicted with special medical conditions." Furthermore, "111 and 74 transported organs and plasma/blood, respectively, 117 carried serums/vaccines and medications, and 40 teams were employed for other associated purposes." This isn’t the first time a Lamborghini has been added to Italy’s Highway Patrol. A couple of Gallardos joined the force a few years ago, and another Huracan was handed to them by Lamborghini in 2015. To mark the delivery, Lamborghini CEO Stefano Domenicali handed the keys to Interior Minister Marco Minniti in a special ceremony. 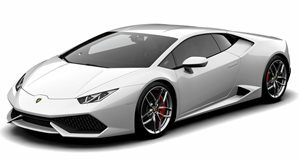 With 610-horsepower and 412 lb-ft of torque, the Huracan will chase down criminals at speeds over 200 mph. Good luck outrunning it if you catch one tailing you.